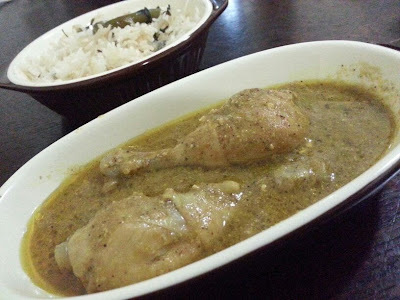 Pepper chicken just like pepper mutton is our favorite. It is cooked exactly in the same way replacing the mutton with the chicken. 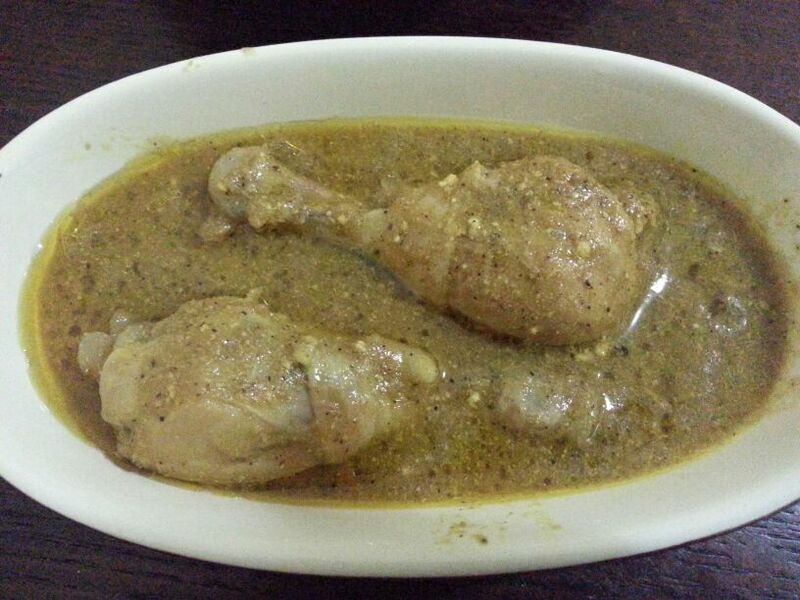 Chicken requires lesser cooking time than mutton and that is the only difference. I like to eat it with Bagarya chawal and also with any type of Indian bread or dosa. I even eat it with Idli at times. 1. In the jar of a mixer add roughly chopped onion, tomato, garlic, peppercorns and coriander leaves. 2. Grind this to a paste and keep aside. 3. Wash and clean chicken and keep it soaked in cold water with some salt for 30 minutes. This will eliminate or reduce the red blood or liquid that oozes when chicken cooks. After 30 minutes discard all the water. Wash chicken once if desired. 4. In a pressure cooker, heat oil. 5. Add the chicken and fry for a minute or two till chicken starts releasing water and turns white. 6. Add the ground masala, salt and turmeric powder and mix well. 7. Let it cook for two minutes. Keep stirring. 8. Add yogurt and mix well. 9. Let it cook on medium heat till most of the water evaporates. 10. Now add some water, cover and pressure cook for 6-8 whistles. 11. Adjust the gravy consistency using water. 12. Cook further on low flame stirring regularly to turn it into a dry side dish. 1. Add more or less peppercorns to achieve desired spice level.